English Name: Hazel Botanical Name (Latin): Corylus avellana Irish Name: Coll Order: DICOTYLEDONES Family: BETULACEAE Brief Description: Shrubby, deciduous tree; catkins (“lamb’s tails”) appearing in early Spring before leaves; leaves hairy, oval; hazel nuts enclosed in leafy bracts. The land surface of Ireland has undergone many transformations. 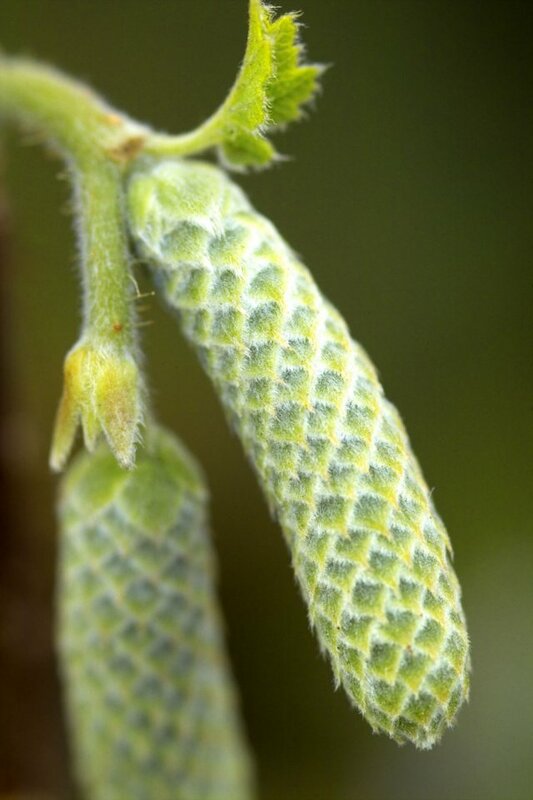 The bare post-glacial tundra was quickly covered with the smaller, pioneer trees, most densely with hazel that crossed the Irish Sea to spread its golden catkins over almost the whole island (many lake muds are still full of hazel pollen and nut fragments and even whole nuts). As bigger trees arrived from the south, each species did best on particular soils. The midlands were dominated by woods of elm and hazel; oak thrived on the more acid soils of the south and north-east; Scots pine (as we now call it) colonized the more exposed acid soils of the western uplands. As the last ice melted, the sea resumed its full circuit around Britain and Ireland. The onset of a warm, moist, 'Atlantic' climate, around 7,000 years ago, was marked by the spread of alder trees and the development of rain-fed bog right across north-west Europe. In Ireland, this growth was helped by another factor: as the island slowly rebounded from the weight of ice, the midland lakes and floodplains were drained of most of their standing water, creating waterlogged fens and marshes that promoted the first formation of peat. Evidence for the fall in water level is found in the groups of limestone boulders, deeply undercut by wave erosion, that stand high and dry around the midland rivers, lakes and bogs. Picture of Pollardstown Fen. 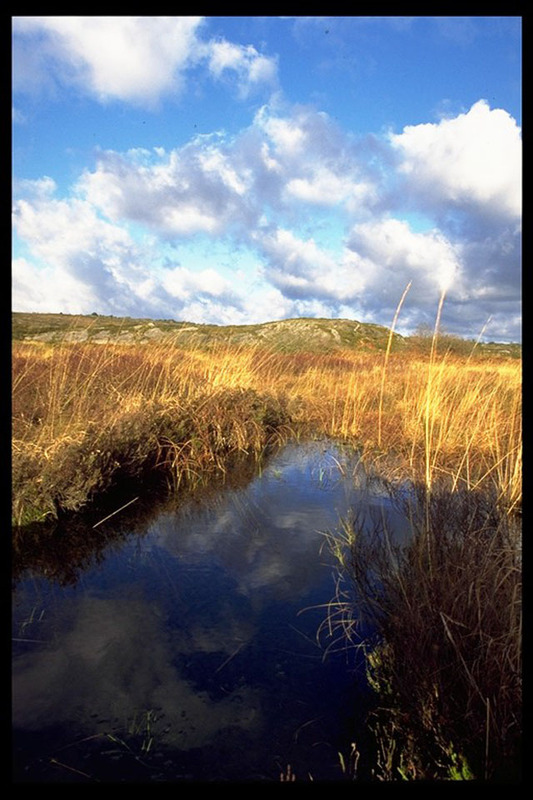 Blue sky with clouds, yellow /orange vegetation of long grasses, rushes and darker coloured shrubs. Large pool at the bottom of picture. Pollardstown Fen is the largest fen of its type in Ireland, reaching 220ha in area. It is now a Nature Reserve and a Special Area of Conservation. The fen began its development 12,000 years ago when a depression in the land surface flooded with water and debris from melting ice. Over time, plants grew and died in the depression forming layers of peat. Generally, this process would continue to form an acidic peat bog, which gets all its nutrients from rainwater, with no contact from groundwater. But Pollardstown fen is fed by 40 calcium rich springs from the Curragh sand and gravel aquifer, making a very different and rare environment. The fen is a glimpse back into Ireland past, holding thousands of years of information in its peat, but also as a picture to how the raised bogs that covered most of the central plain would have once started life. All well-nourished lakes have a tendency to fill themselves in with the debris of plants. In the absence of oxygen, this humus fails to rot down and is compressed into peat. As the post-glacial fens firmed up above the water table, mosses and liverworts began to lift the surface further. When the calcium in the water drawn up from the soil was exhausted, conditions turned acid and the vegetation changed to suit a leaner regime. Heathers appeared, along with new and stringier sedges. Insectivorous sundews and butterwort offered sticky leaves to trap passing flies and gained nutrients from digesting them. Trees such as birch, alder, willow and pine spread out across the surface in a wet and tangled woodland. On its waterlogged floor grew the sphagnum mosses that would secure the final transformation of the post-glacial fens.